(CNN) -- Pro-democracy movements that have swept across the Middle East and North Africa began to reach Libya in January, when demonstrators broke into a housing project the government was building and occupied it. Libyan leader Moammar Gadhafi's government responded with a $24 billion fund for housing and development. More demonstrations were sparked when police detained relatives of those killed in an alleged 1996 massacre at the Abu Salim prison, according to Human Rights Watch. High unemployment has also fueled the protests, as have anti-Gadhafi groups. Three days after the fall of Egyptian President Hosni Mubarak, calls go out on Facebook for peaceful demonstrations in Libya against leader Moammar Gadhafi. The Libyan leader, who has ruled over the country for more than four decades, voiced support for Mubarak during the Egyptian crisis. Roughly 200 protesters take to the streets in the coastal city of Benghazi to show support for lawyer and human rights activist Fathi Terbil, according to witnesses. Several are arrested amid confrontations with police. A highly placed source close to the Libyan government tells CNN, "there is nothing serious here. These are just young people fighting each other." State-run media reports that the government has released 110 political prisoners and that a committee would be convened to consider major changes to the government. Calls are posted on websites for a "Day of Rage" on what is the five-year anniversary of an incident in which security forces killed at least a dozen protesters. Seven people are killed in clashes between security forces and anti-government protesters, according to medical sources. Raucous pro-government demonstrators take to the streets in the nation's capital in support of Gadhafi, witnesses say. Images from state television, labeled as "live," feature men chanting pro-Gadhafi slogans, waving flags and singing around the Libyan leader's limousine as it creeps through Tripoli. In Benghazi, human rights groups and protesters claim they're under attack by pro-government security forces. Among the tens of thousands of protesters who take to the streets, at least 20 people are killed and 200 are wounded, according to medical sources. Protests continue to turn violent, however the death and injury toll is unclear. In Benghazi, witnesses report bloody clashes with soldiers firing tear gas and bullets. A doctor treating the injured at Al Jala hospital says at least 30 people are dead, most of them from gunshot wounds to the head. Witnesses say protests have erupted in cities across the country, including al-Baida, Ajdabiya and Misratah, where anti-government protesters leaving noon prayers at a local mosque were confronted by demonstrators supportive of Libyan leader Moammar Gadhafi. Human Rights Watch reports that 84 people have been killed in Libyan demonstrations since Tuesday. The organization bases that estimate on telephone calls made to medical providers across the country. 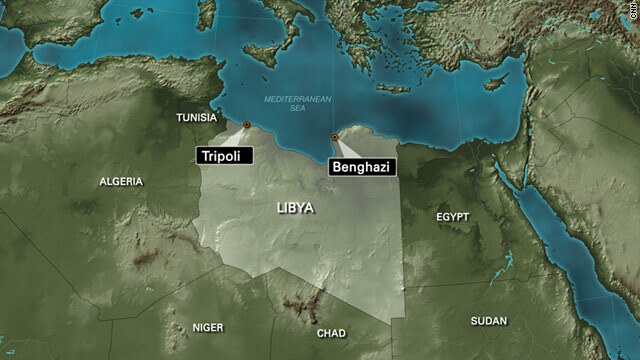 Violence surges in Benghazi where eyewitness say protesters have taken control of the city and much of Tripoli. Gadhafi's son, Saif al-Islam Gadhafi, appears on state television to warn demonstrators that if their protests do not subside, the country could fall into a civil war.